StopFake: Fact-checking the news and events in Ukraine. Facebook and Google and their humongous data crunching machines flourish while fine media wilt. How to compete? They take media’s original costly-to-produce-content for free and make it available to users to circulate, anticipating their needs with their intelligent algorithms. Earnings of course go where the public is and, hence, newspapers and digital news outlets are having to squeeze the newsrooms, and produce meaningless stories about cats to get the clicks, and sack the newsroom savvies who covered wars, told the difficult stories, racked the muck and hold power accountable. Now they can only afford inexperienced journalists who can churn out the news as if they were sausage factories; little or no editing, hardly any verification, the truth-finding business turned into white noise, official propaganda, infotainment, producing anything but hard-to-dig truths. However, just when many were forecasting doomsday for journalism, stories of Davids against Goliaths spring about in the world: small teams of journalists using the same technologies developed by the giants to find sources out in the world wide open web, to produce stories that expose wrongdoings by mighty rulers and potent corporations. These reporters learn how to play with the available software, use social networks and chatting services to collaborate with each other across borders and also, to contrast information and then, publish simultaneously to give power to their punches. Despite the uncertain future, opportunity is knocking on the door of journalism. Millions of sources are open to be used by journalists and techies. For example, Bellingcat, a group of citizen investigative journalists, tracked the route of the Buk missile-launcher carrying the missile that was to down the Malaysian Airlines plane over Eastern Ukraine. They used Google Earth (as well as work on-site), to verify the locations depicted in photos posted by the public; satellite pictures (the purchase of which was crowd-funded) and photos of Russian soldiers on the social networking site VKontakte that enabled the investigators to determine to which military unit the missile launcher belonged. 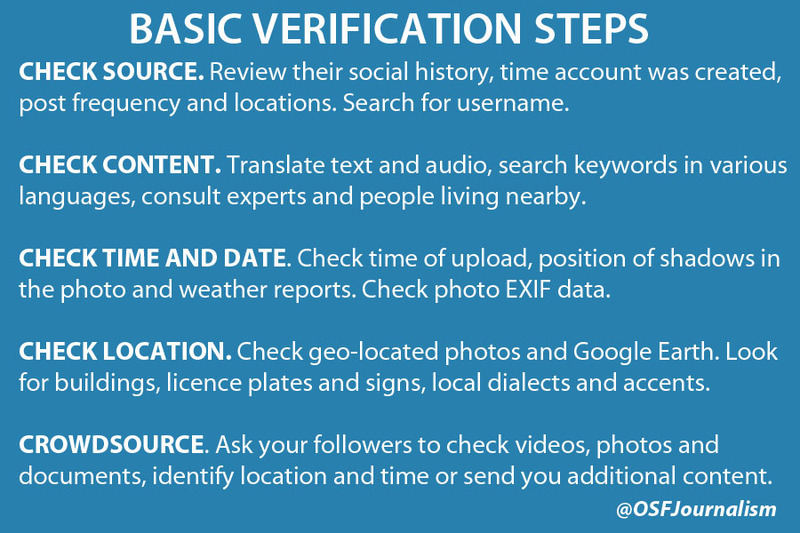 Bellingcat also used Checkdesk, a collaboration platform, to ask citizens to verify the authenticity of specific videos and photos posted in social media and Bridge, a crowdsourcing translation tool, for quick verification of significant events during the war in Ukraine. Journalists of Rutas del Conflicto are completing a data-base of massacres in Colombia with the victims’ aid. They want every name to be right, to bring back some humanity to the insanity of a country still resistant to look at the real face of its own tragedy; Kenyan Joshua Ogure and his friends managed to use GPS to put their beloved neighbourhood of the Kibera in the outskirts of Nairobi on the map and discovered that 81 percent of the schools were considered informal and that the government had only built 4 percent of Kibera’s schools to host almost 60.000 students. Other groups, such as Chequeado in Argentina, Africa Check in South Africa, Stop-Fake in Ukraine, follow public discourses of their leaders and fellow journalists, join forces with users and check them with publicly available data to help citizens sort out truth from deception. According to the Reporter’s Lab, there are currently 96 active fact-checking projects in 37 countries; the third Global Fact-Checking Summit will bring leading fact-checkers to Buenos Aires in June. Despite the uncertain future, opportunity is knocking on the door of journalism. Millions of sources –from public databases and leaked documents to photos posted in social networks and experts and witnesses among the readers – are open to be used by journalists and techies. There seems to be no limit to what reporters can discover and verify across countries and topics to hold power accountable and unearth thorny truths. Every March Chequeado gathers around 80 volunteer fact-checkers – students and academics – to live-check the yearly speech of Argentinean president. They follow every reference to statistics on topics including economy and demographics and check in the appropriate database if the fact is true. Chequeado has also a large online community of fact-checkers following the speech. “We are sure that the people who are involved in producing information, are more prepared to criticize what the media and leaders are saying,” says Laura Zommer, executive director at Chequeado. Reported.ly is a new type of newsroom where journalists, based all over the world, report, verify and investigate international stories emerging on social media and the open web. By using satellite images, tracking flights and maritime routes and crowdsourced citizen videos they were able to follow arms trade between Italy and Saudi Arabia and the use of arms against civilians in Yemen. “This is becoming traditional reporting,” says Malachy Browne, managing editor at Reported.ly. “By applying these methods and tools, we are able to cover a disproportioned amount of stories on what’s happening around the world,” he adds. First Draft News is a new community made up of media organizations working on open source investigations and verification of eyewitness content. The site offers free training resources for journalists looking for best ways to use social media content in their newsrooms. This story originally appeared in the May 2016 newsletter of the Open Society Foundation’s Program on Independent Journalism and is reprinted with permission. Traditional war reporting, which mostly focused on revealing the brutality of the conflict in Colombia, is being replaced by new storytelling techniques using alternative narratives and creative digital tools. Here’s Proyecto Coca, Rutas del Conflicto and 4 Ríos.